AUD 5,586 Excl. Duties / Taxes. This Trilliant diamond is 1 carat in weight, and comes with Very Good polish and Good symmetry, as verified from an independent gemological laboratory. The diamond is graded J in colour, and has a clarity grade of SI1. The diamond's GIA grading report number is 2165486392, which will detail further its specifications and measurements, and will also come with the purchase of the stone. This Trilliant diamond is 1.18 carat in weight, and comes with Very Good polish and Very Good symmetry, as verified from an independent gemological laboratory. The diamond is graded J in colour, and has a clarity grade of SI1. The diamond's GIA grading report number is 1162486389, which will detail further its specifications and measurements, and will also come with the purchase of the stone. AUD 5,924 Excl. Duties / Taxes. This Trilliant diamond is 1.2 carat in weight, and comes with Good polish and Good symmetry, as verified from an independent gemological laboratory. The diamond is graded J in colour, and has a clarity grade of SI1. The diamond's GIA grading report number is 15751720, which will detail further its specifications and measurements, and will also come with the purchase of the stone. AUD 21,975 Excl. Duties / Taxes. This Triangular diamond is 3.51 carat in weight, and comes with Excellent polish and Excellent symmetry, as verified from an independent gemological laboratory. The diamond is graded J in colour, and has a clarity grade of SI2. The diamond's GIA grading report number is 6251393649, which will detail further its specifications and measurements, and will also come with the purchase of the stone. AUD 3,334 Excl. Duties / Taxes. This Triangular diamond is 1.02 carat in weight, and comes with Excellent polish and Excellent symmetry, as verified from an independent gemological laboratory. The diamond is graded J in colour, and has a clarity grade of SI1. The diamond's GIA grading report number is 1308035316, which will detail further its specifications and measurements, and will also come with the purchase of the stone. AUD 3,436 Excl. Duties / Taxes. This Trilliant diamond is 0.9 carat in weight, and comes with Very Good polish and Very Good symmetry, as verified from an independent gemological laboratory. The diamond is graded J in colour, and has a clarity grade of SI1. The diamond's GIA grading report number is 1182692816, which will detail further its specifications and measurements, and will also come with the purchase of the stone. AUD 23,128 Excl. Duties / Taxes. This Kite diamond is 2.52 carat in weight, and comes with Excellent polish and Very Good symmetry, as verified from an independent gemological laboratory. The diamond is graded J in colour, and has a clarity grade of VS2. The diamond's GIA grading report number is 5326248311, which will detail further its specifications and measurements, and will also come with the purchase of the stone. AUD 81,114 Excl. Duties / Taxes. This Briolette diamond is 5.6 carat in weight, and comes with Very Good polish and Good symmetry, as verified from an independent gemological laboratory. The diamond is graded J in colour, and has a clarity grade of VS2. The diamond's GIA grading report number is 16856112, which will detail further its specifications and measurements, and will also come with the purchase of the stone. AUD 1,532 Excl. Duties / Taxes. This Trilliant diamond is 0.61 carat in weight, and comes with Good polish and Good symmetry, as verified from an independent gemological laboratory. The diamond is graded J in colour, and has a clarity grade of SI2. The diamond's GIA grading report number is 2195858509, which will detail further its specifications and measurements, and will also come with the purchase of the stone. AUD 1,428 Excl. Duties / Taxes. This Triangular diamond is 0.61 carat in weight, and comes with Very Good polish and Good symmetry, as verified from an independent gemological laboratory. The diamond is graded J in colour, and has a clarity grade of SI2. The diamond's GIA grading report number is 6225228325, which will detail further its specifications and measurements, and will also come with the purchase of the stone. AUD 1,307 Excl. Duties / Taxes. This Square diamond is 0.51 carat in weight, and comes with Excellent polish and Good symmetry, as verified from an independent gemological laboratory. The diamond is graded J in colour, and has a clarity grade of SI1. The diamond's GIA grading report number is 6194885716, which will detail further its specifications and measurements, and will also come with the purchase of the stone. This Other diamond is 0.45 carat in weight, and comes with Good polish and Fair symmetry, as verified from an independent gemological laboratory. The diamond is graded J in colour, and has a clarity grade of VS1. The diamond's GIA grading report number is 2151262662, which will detail further its specifications and measurements, and will also come with the purchase of the stone. This Half Moon diamond is 0.48 carat in weight, and comes with Good polish and Good symmetry, as verified from an independent gemological laboratory. The diamond is graded J in colour, and has a clarity grade of SI2. The diamond's GIA grading report number is 2175457159, which will detail further its specifications and measurements, and will also come with the purchase of the stone. This Shield diamond is 1.01 carat in weight, and comes with Excellent polish and Very Good symmetry, as verified from an independent gemological laboratory. The diamond is graded J in colour, and has a clarity grade of VS2. The diamond's GIA grading report number is 2296072094, which will detail further its specifications and measurements, and will also come with the purchase of the stone. AUD 13,293 Excl. Duties / Taxes. This Trilliant diamond is 2.2 carat in weight, and comes with Very Good polish and Very Good symmetry, as verified from an independent gemological laboratory. The diamond is graded J in colour, and has a clarity grade of SI2. The diamond's GIA grading report number is 2126233811, which will detail further its specifications and measurements, and will also come with the purchase of the stone. AUD 1,898 Excl. Duties / Taxes. This Trilliant diamond is 0.7 carat in weight, and comes with Very Good polish and Very Good symmetry, as verified from an independent gemological laboratory. The diamond is graded J in colour, and has a clarity grade of SI2. The diamond's GIA grading report number is 1313966610, which will detail further its specifications and measurements, and will also come with the purchase of the stone. AUD 2,502 Excl. Duties / Taxes. This Trilliant diamond is 0.87 carat in weight, and comes with Excellent polish and Very Good symmetry, as verified from an independent gemological laboratory. The diamond is graded J in colour, and has a clarity grade of SI1. The diamond's GIA grading report number is 6325362494, which will detail further its specifications and measurements, and will also come with the purchase of the stone. AUD 4,226 Excl. Duties / Taxes. This Trilliant diamond is 1.2 carat in weight, and comes with Excellent polish and Very Good symmetry, as verified from an independent gemological laboratory. The diamond is graded J in colour, and has a clarity grade of SI2. The diamond's GIA grading report number is 2316553900, which will detail further its specifications and measurements, and will also come with the purchase of the stone. AUD 11,597 Excl. Duties / Taxes. This Trilliant diamond is 2.31 carat in weight, and comes with Very Good polish and Excellent symmetry, as verified from an independent gemological laboratory. The diamond is graded J in colour, and has a clarity grade of SI1. The diamond's GIA grading report number is 6193996845, which will detail further its specifications and measurements, and will also come with the purchase of the stone. This Hexagonal diamond is 0.45 carat in weight, and comes with Good polish and Good symmetry, as verified from an independent gemological laboratory. The diamond is graded J in colour, and has a clarity grade of VS1. The diamond's GIA grading report number is 2195818914, which will detail further its specifications and measurements, and will also come with the purchase of the stone. AUD 1,123 Excl. Duties / Taxes. This Baguette diamond is 0.46 carat in weight, and comes with Good polish and Fair symmetry, as verified from an independent gemological laboratory. The diamond is graded J in colour, and has a clarity grade of SI1. The diamond's GIA grading report number is 2191524430, which will detail further its specifications and measurements, and will also come with the purchase of the stone. 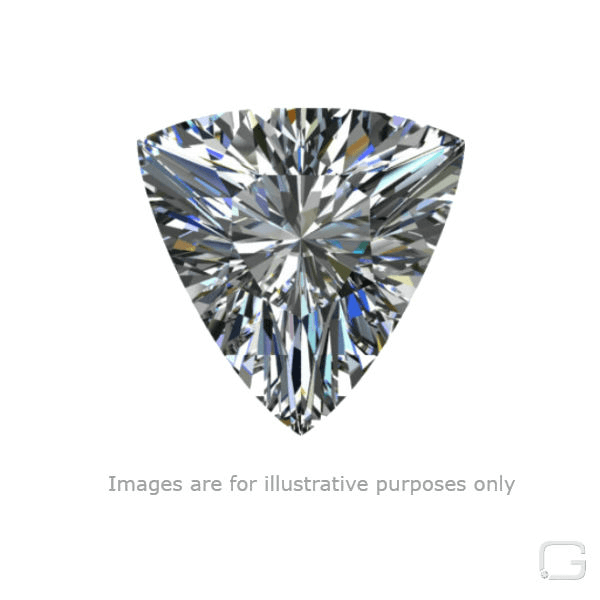 This Trilliant diamond is 1.01 carat in weight, and comes with Good polish and Good symmetry, as verified from an independent gemological laboratory. The diamond is graded J in colour, and has a clarity grade of SI2. The diamond's GIA grading report number is 1156511566, which will detail further its specifications and measurements, and will also come with the purchase of the stone. AUD 27,153 Excl. Duties / Taxes. This Octagonal diamond is 3.15 carat in weight, and comes with Very Good polish and Very Good symmetry, as verified from an independent gemological laboratory. The diamond is graded J in colour, and has a clarity grade of SI2. The diamond's GIA grading report number is 2286275444, which will detail further its specifications and measurements, and will also come with the purchase of the stone. AUD 6,493 Excl. Duties / Taxes. This Triangular diamond is 1.5 carat in weight, and comes with Very Good polish and Very Good symmetry, as verified from an independent gemological laboratory. The diamond is graded J in colour, and has a clarity grade of SI1. The diamond's GIA grading report number is 6282939041, which will detail further its specifications and measurements, and will also come with the purchase of the stone. AUD 2,543 Excl. Duties / Taxes. This Other diamond is 0.78 carat in weight, and comes with Very Good polish and Good symmetry, as verified from an independent gemological laboratory. The diamond is graded J in colour, and has a clarity grade of VS2. The diamond's GIA grading report number is 1156301684, which will detail further its specifications and measurements, and will also come with the purchase of the stone. AUD 1,937 Excl. Duties / Taxes. This Trilliant diamond is 0.8 carat in weight, and comes with Good polish and Good symmetry, as verified from an independent gemological laboratory. The diamond is graded J in colour, and has a clarity grade of SI2. The diamond's GIA grading report number is 1196349066, which will detail further its specifications and measurements, and will also come with the purchase of the stone. AUD 1,481 Excl. Duties / Taxes. This Trilliant diamond is 0.51 carat in weight, and comes with Good polish and Good symmetry, as verified from an independent gemological laboratory. The diamond is graded J in colour, and has a clarity grade of SI1. The diamond's GIA grading report number is 1182541361, which will detail further its specifications and measurements, and will also come with the purchase of the stone.